Electronic health records (EHRs) have long promised significant improvements in quality, safety, and efficiency. However, much of the evidence for these benefits comes from a small number of sites that have advanced EHRs and, in many cases, decades of experience using them. As EHRs become more widespread, these benefits are being realized inconsistently in other settings, and we still have much to learn about the best ways to implement and use EHRs. Although our knowledge of EHRs is incomplete, their adoption is increasing rapidly. The rate is particularly steep in the United States, spurred by the passage of the Health Information Technology for Economic and Clinical Health (HITECH) Act, which included an incentive program offering payments to eligible healthcare professionals and hospitals who adopt EHRs. Under the program, commonly referred to as “meaningful use,” CMS has already paid out more than $25 billion in incentives. In the most recent data available, 56% of eligible healthcare professionals and 93% of eligible hospitals had received at least one incentive payment under the program. The adoption of EHRs causes significant changes in the day-to-day experience of those practicing medicine, often shifting duties to physicians or asking them to work in new ways. EHRs also affect the doctor-patient relationship by introducing a third element—the computer—into the dyad. To realize the promise of EHRs, more work is needed. Practically, we need to improve and optimize the systems being implemented today, and more research is needed to fully understand the effects of EHR adoption and to identify best practices to maximize their potential. In this issue of JGIM, several articles explore aspects of this changing dynamic. Weeks et al. report on a survey of healthcare providers in Idaho and Washington who had and had not attested under the meaningful use program1. Although providers who had completed attestation were more positive about the program than providers still working on attestation, both groups expressed concern that the program was contributing to the decline of “the art of medicine.” In a related commentary, Ancker calls for improvements in EHR user interfaces, data capture methods, workflow integration, and data use tools2. A key aspect of federal EHR programs is health information exchange—technologies for sharing health information across provider boundaries. In a qualitative study, Nguyen, et al. describe a twist on this paradigm, which they term the "social-health information exchange (S-HIE)"3. The S-HIE would support information-sharing about patients between the healthcare and social service settings, with the goal of optimizing and coordinating services provided by both. EHRs aren’t the only technology that affects the doctor-patient relationship. In a systematic review, Levine et al. explore the effects of technology-assisted weight loss interventions in primary care settings, finding that such interventions can be useful, but identifying a critical gap in best practices for integrating and balancing the roles of the patient, the physician, and technology4. In an exercise in clinical reasoning, Manesh, et al. describe a difficult case of a patient presenting with painless jaundice. As tests are performed, a clear diagnosis is slow to emerge, and so the authors turn to Bayes’ theorem and explicit quantitative reasoning regarding the diagnosis. Although the technology they use—a shortcut likelihood ratio table—is simple, it steers them through the process of diagnosing their patient5. A major goal of EHRs is to increase information available for physician decision-making. However, the doctor-patient relationship can also be complicated by the presence of too much information about the patient. In a comment, Baker et al. explore the challenging territory of “Googling” one’s patients in two case studies6. 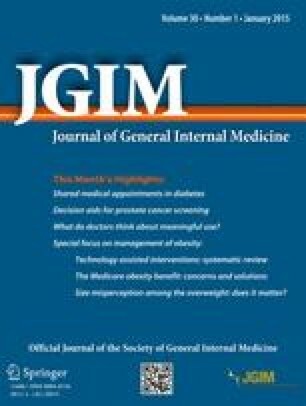 Accompanying this issue of JGIM is a special supplement with articles describing the results of a large study funded by the Office of the National Coordinator for Health Information Technology (ONC), the federal office that oversees most aspects of the U.S. EHR program. In this study, patients were given unprecedentedly granular control over the use and disclosure of their health information, with the option to restrict access to particular data elements, or to the record in its entirety, for any or all members of their healthcare team. The rights of patients to view and control sharing of their health information are widely recognized and formalized under the Health Insurance Portability and Accountability Act (HIPAA) and related regulations. However, these regulations contain broad allowances for the use of protected health information in patient care. This study gave patients considerably more control. The supplement begins with an article by Karen DeSalvo, MD, MPH, MSc, current National Coordinator for Health Information Technology, and Kory Mertz from ONC7. A perspective by Meslin et al. outlines an ethical framework for fair information practices that seeks to balance patient autonomy with the provider’s need for information to render care, and this framework underlies the rest of the project8. Caine et al. describe a series of formative patient interviews that were used to design the new patient-control system, while Leventhal et al. describe the technical design of the system as well as the organizational challenges encountered in its construction9 , 10. Of the patients invited to participate in the study, 75.5% enrolled and used the tool. Schwartz et al. describe the actions taken by the patients who used the system, reporting that 43% of patients imposed at least one restriction in access to their health information, with just under 5% denying access to all of their information for all members of the healthcare team11. Provider responses to these restrictions are explored by Tierney et al.12, who found that providers used the "break-the-glass" function fairly infrequently. A slight majority of providers in the study agreed that patient control of their health information was important, but most also felt that patient-controlled redaction posed risks to the doctor-patient relationship and to quality of care. The supplement concludes with a point-counterpoint debate by Caine and Tierney and a perspective by David Blumenthal, MD, MPP, former National Coordinator for Health Information Technology and current president of The Commonwealth Fund, and David Squires, also of Commonwealth, which lays out future challenges and questions about patient control of health information13 , 14. The work described in this supplement breaks much new ground. Although the idea of granular patient control of health information has been discussed in privacy and ethics circles for some time, this study is the first to pragmatically test a tool in a real-world clinical environment with real clinical consequences. Securing provider participation in the study was challenging, and many providers were initially skeptical about giving patients new control of their data. After the study, it seems that much of their skepticism remained. Patients did adopt the tool, with a significant minority choosing to impose restrictions, some of them quite broad. Many questions remain. Some are practical, such as how to improve technology in order to gather patient perspectives or integrate it with EHRs, but most are more philosophical, including how to help patients appreciate the potential consequences of their disclosure and redaction decisions, how to ensure that providers have the information needed to treat patients safely while respecting their autonomy, and how to design future regulations and policies to support these endeavors. In the end, technology is certain to change the doctor-patient relationship. As researchers and practitioners, we have an opportunity and responsibility to use technology smartly, study its consequences—good and bad—and do all that we can to ensure that technology benefits this vital relationship. There is much work to do. Weeks DL, Keeney BJ, Evans PC, Moore QD, Conrad DA. Provider Perceptions of the Electronic Health Record Incentive Programs: A Survey of Eligible Professionals Who Have and Have Not Attested to Meaningful Use. J Gen Intern Med. DOI: 10.1007/s11606-014-3008-5. Ancker JS. Capsule Commentary on Weeks, et al., Provider Perceptions of the Electronic Health Record Incentive Programs: A Survey of Eligible Professionals Who Have and Have Not Attested to Meaningful Use. J Gen Intern Med. DOI: 10.1007/s11606-014-3045-0. Nguyen OK, Chan CV, Makam A, Stieglitz H, Amarasingham R. Envisioning a Social-Health Information Exchange as a Platform to Support a Patient-Centered Medical Neighborhood: A Feasibility Study. J Gen Intern Med. DOI: 10.1007/s11606-014-2969.8. Levine DM, Savarimuthu S, Squires A, Nicholson J, Jay M. Technology-Assisted Weight Loss Interventions in Primary Care: A Systematic Review. J Gen Intern Med. DOI: 10.1007/s11606-014-2987-6. Manesh RS, Dixson J, Kohlwes J. Don’t Drop the Anchor. J Gen Intern Med. DOI: 10.1007/s11606-014-2995-6. Baker MJ, George DR, Kauffman G. Navigating the Google Blind Spot: An Emerging Need for Professional Guidelines to Address Patient-Targeted Googling. J Gen Intern Med. DOI: 10.1007/s11606-014-3030-7.